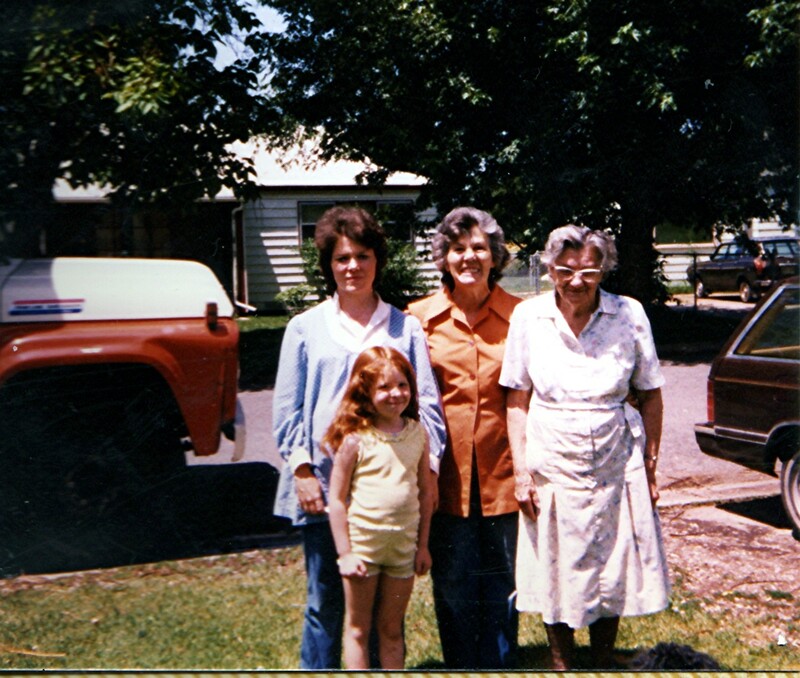 This is another photo sent to me by Nelda Clontz Lemburg, whose mother is a Sharp. This is a better copy of the photo than the one I had. 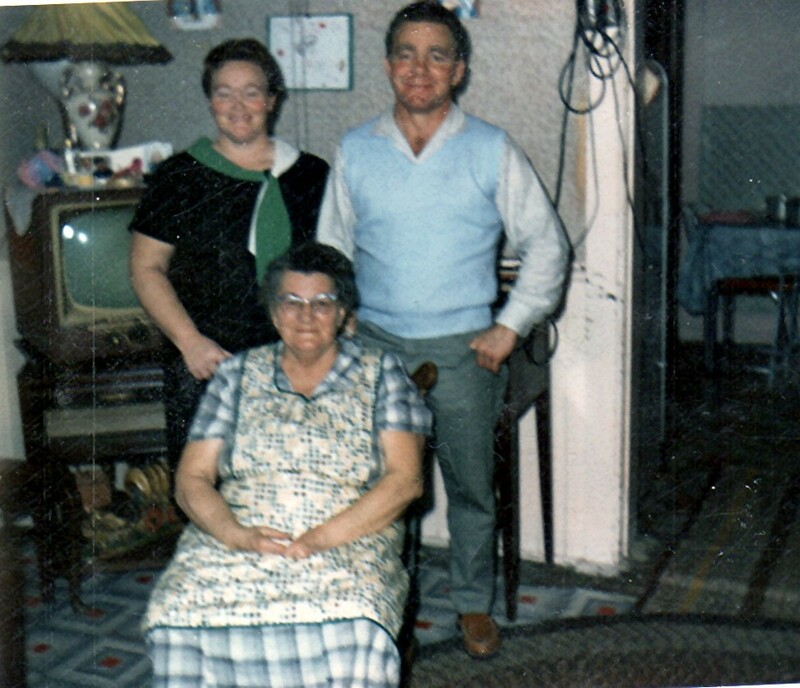 I have previously written of “Uncle Ed” and included this photo. 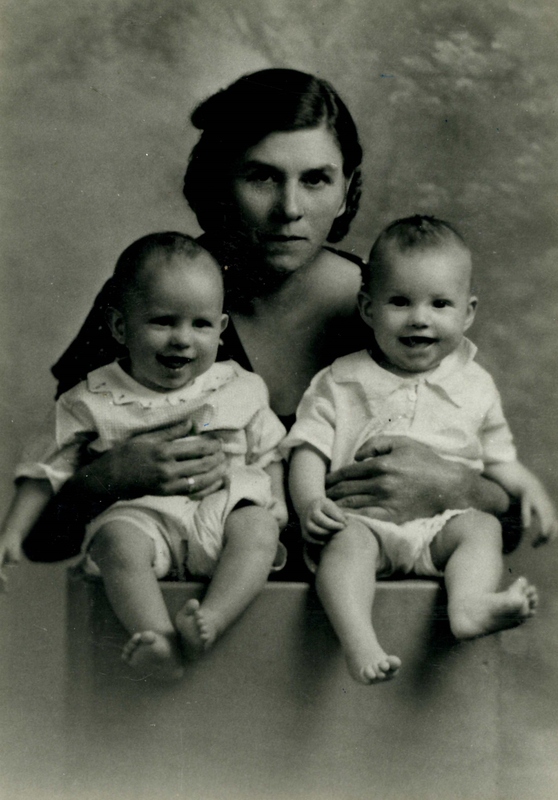 This is Lillie Elva East Sharp with her son, Dean Sharp, and grandson, Gary Eugene Blanch. 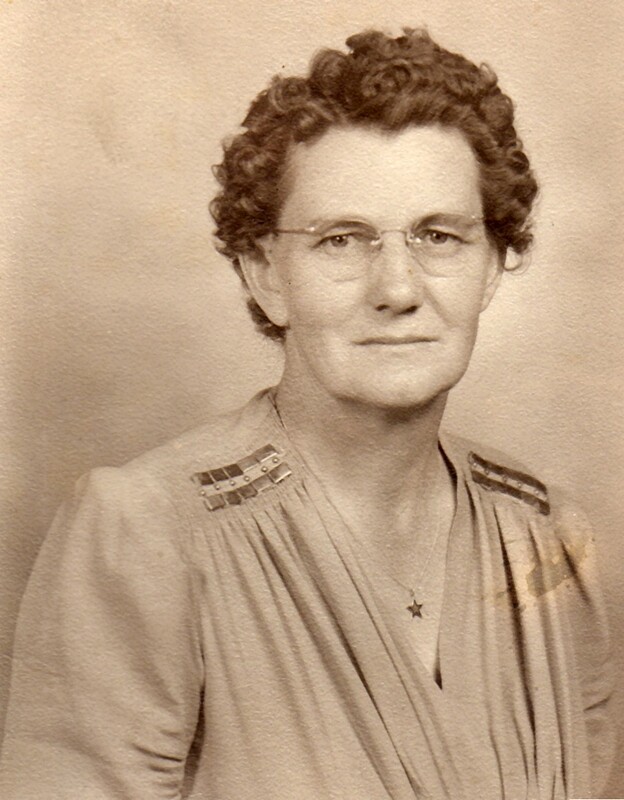 Lillie Elva East was born 16 February 1888 in Warren, Weber, Utah to Louisa Calder East and Joseph Uriah East. 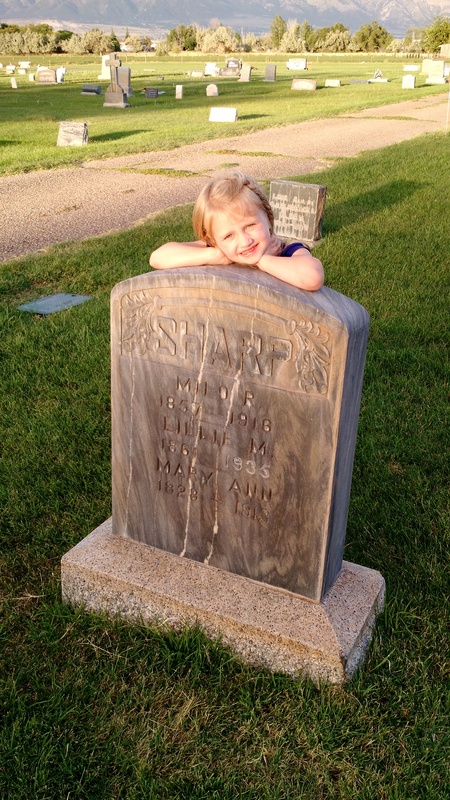 She and Edward William Sharp married 19 May 1909 in Plain City, Weber, Utah. 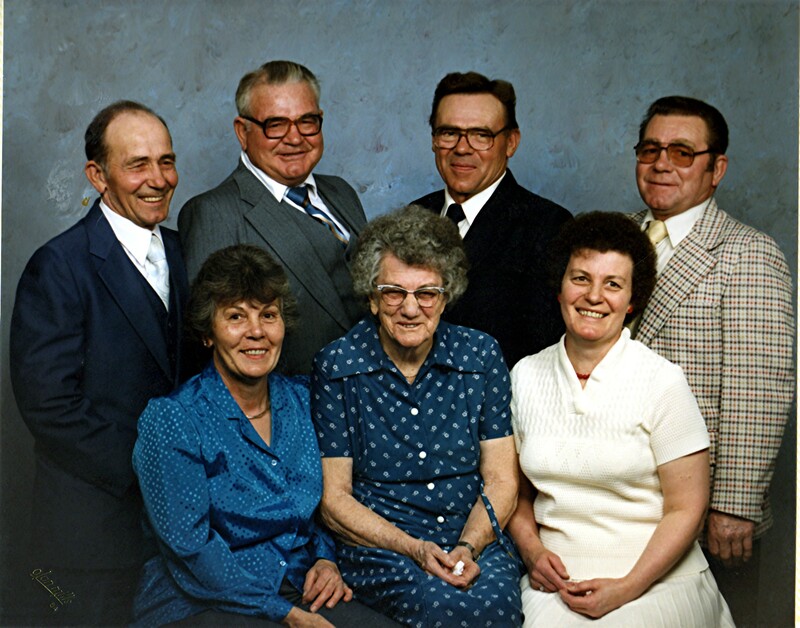 As I mentioned in the article about Uncle Ed, together they had 10 children, nine of which lived to adulthood. 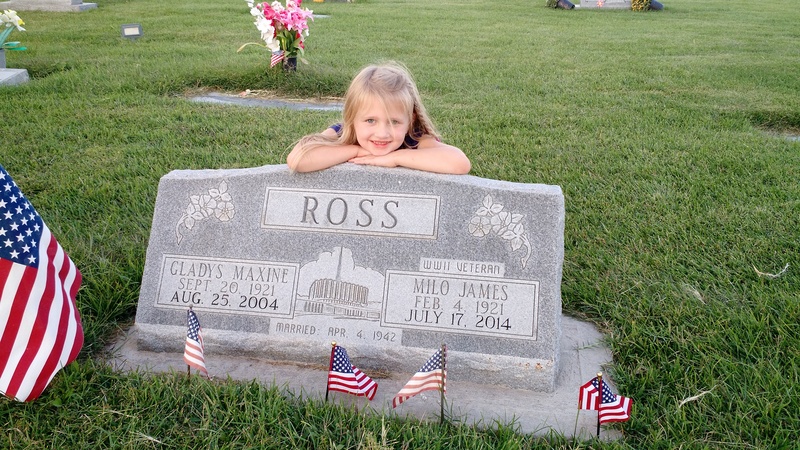 Grandpa, Milo James Ross, said that his Aunt Lillie, who quintessentially became his mother, was a beautiful woman. He loved her but his life was dominated enough by Uncle Ed that he did not get to spend as much time with her as he wished. Herbert and Martha Coley are pleased to announce the marriage of their daughter Lillian to Joseph Nelson Jonas, son of Joseph and Annie Jonas. They were married 6 September 1916 in Logan, Cache, Utah at the LDS Temple. 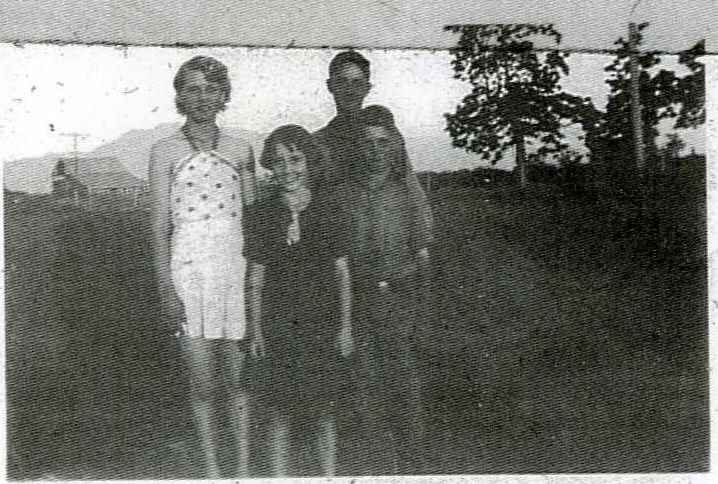 The photo above we think was taken around 1930 or so and is not a wedding photo. 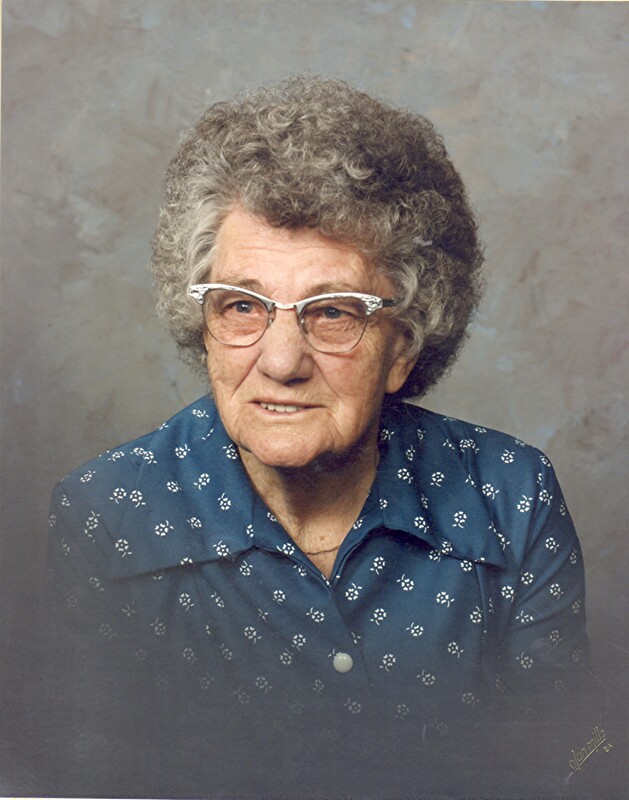 Lillian was born the first child of ten to Martha Christiansen and Herbert Coley 26 August 1898 in Lewiston, Cache, Utah. 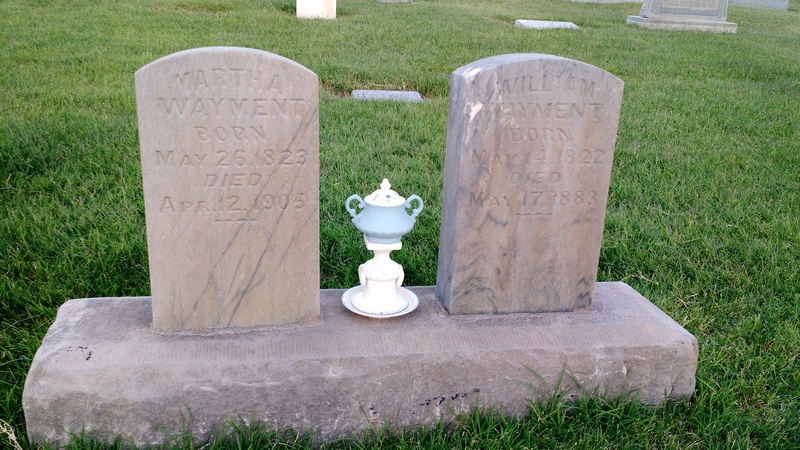 Both Herbert and Martha were Mormon immigrants to Utah in the 1880’s. Herbert and Martha both had native land accents from England and Norway respectively. 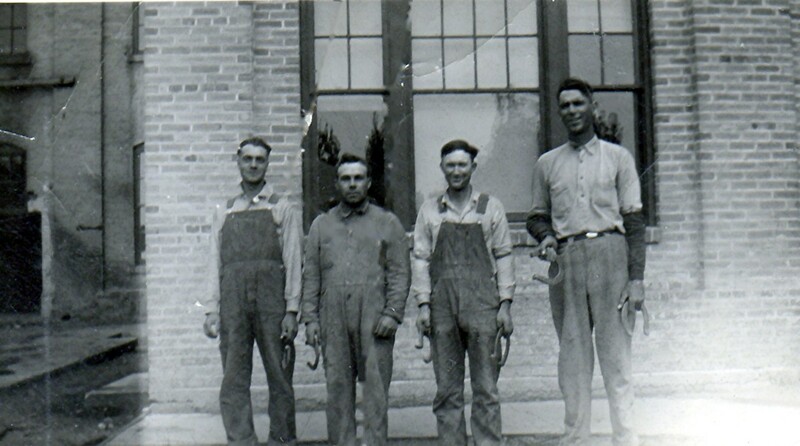 Herbert was a diligent laborer who would acquire full ownership in their home by 1910. Martha was a strict and involved homemaker and mother. 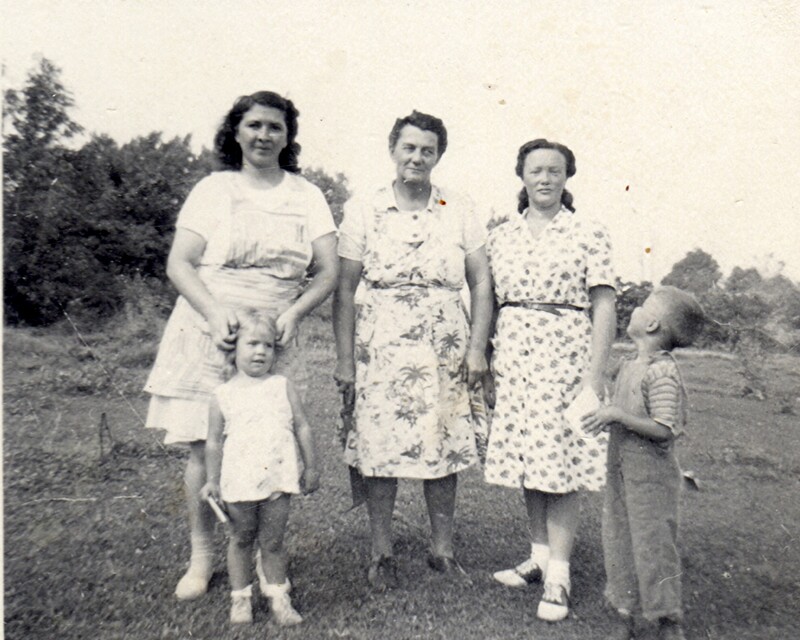 Lillian grew up assisting her mother in maintaining the home, large garden, and raising younger siblings. By the the time she married, she had six younger children who were in the home (three more were yet to be born). When Lillian was born, the family lived in Lewiston. 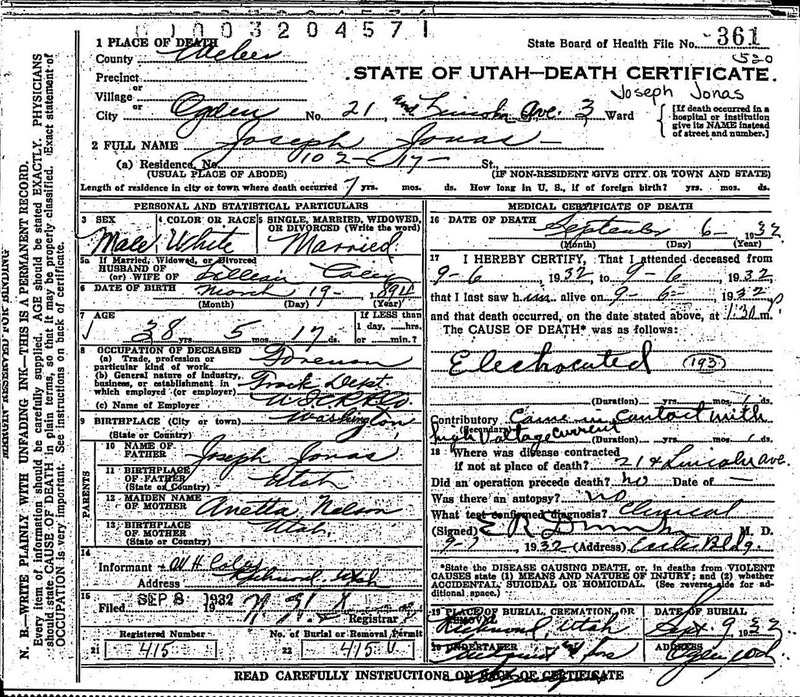 By 1910, the family had moved to Wheeler, Cache, Utah (or the 1900 Census did not have Wheeler broken from Lewiston). The Wheeler area is almost 6 miles directly to the west from Richmond, Cache, Utah as indicated by the link. We do not know where they lived in Wheeler. By the time Lillian married Joseph, the family lived at roughly 1950 E 9000 N to the south and east of Richmond. The remainder of the cabin built by Herbert Coley was still in the middle of a cow pen in fall 2012 on the south side of the road, but was in pretty poor condition. Ellis Jonas took me there about 2002 and indicated the home to me as where they lived when he was a little boy. 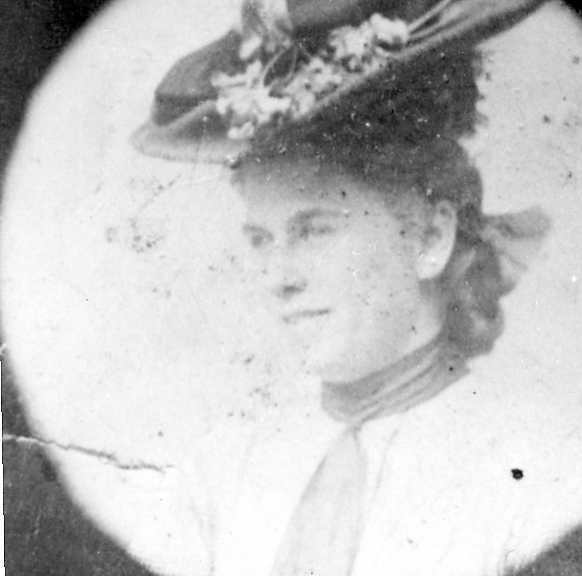 Martha moved in to town, Richmond, after Herbert passed away in 1946. 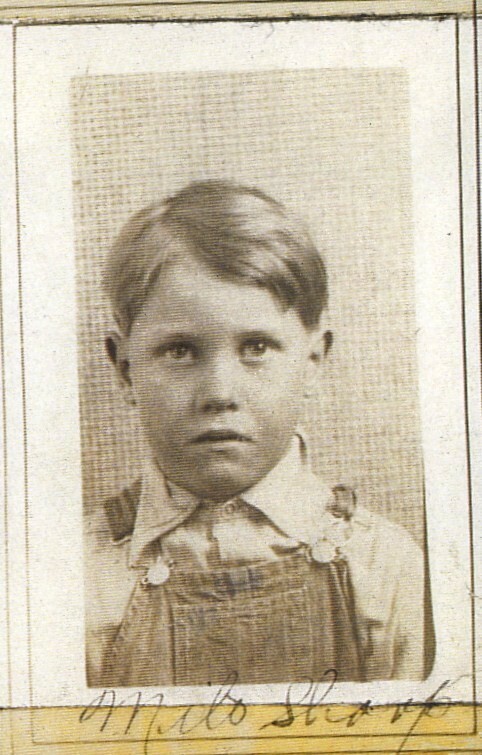 Joseph Nelson Jonas was the sixth of seven child born to Annetta Josephine Nelson and Joseph Jonas 19 November 1893 in or near Ellensburg, Kittitas, Washington. About 1896, Joseph’s mother, Annie, went to the Eastern Washington Hospital for the Insane in Fancher, Spokane, Washington (she is listed as Ann J Jonas). She was in and out of hospitals throughout her life but as Joseph was one of the younger children, he would not have known his mother a little better. Annie got out of the Eastern Washington Hospital 31 October 1899 and went home to Ellensburg and continued to be a handful for the family. The family on the 1900 Census in Cle Elum, Kittitias, Washington does not include Annie though and the census that year has Joseph Sr in both Cle Elum and Spokane about two weeks apart in June 1900. 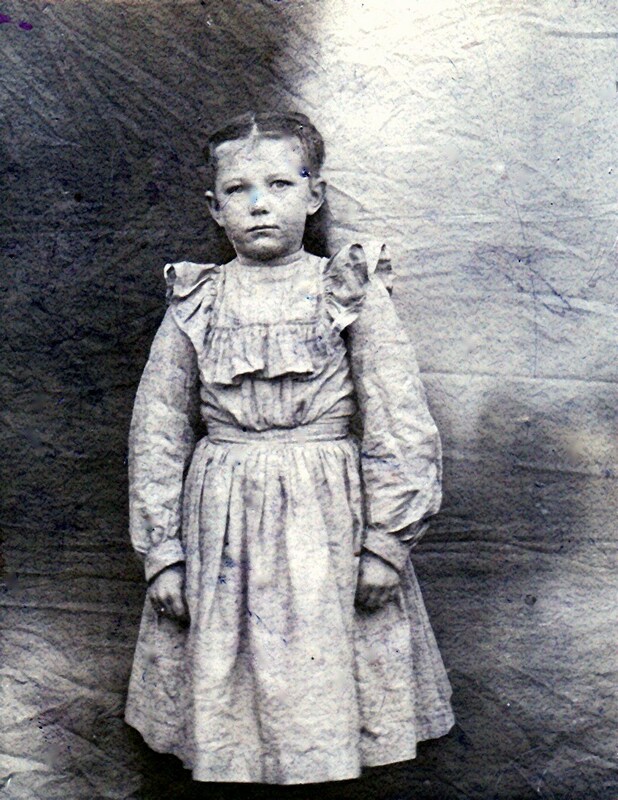 Annie’s sister, Charlotte, visited in 1901. 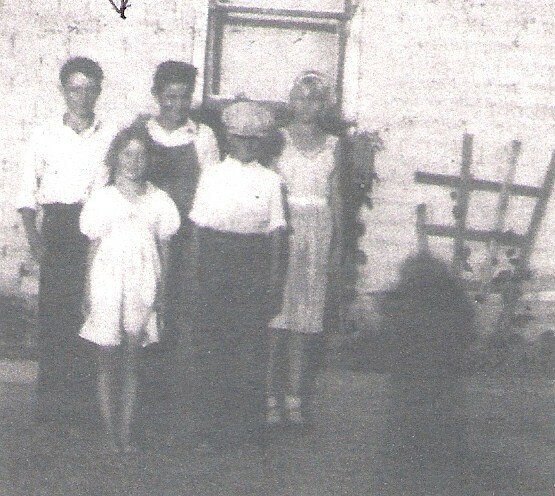 Due to Annie’s mental and emotional state, and with Joseph Sr’s approval, the whole Jonas family went to Utah to stay temporarily with Annie’s brother, Nels August Nelson. Uncle August lived in Crescent, Salt Lake, Utah and the Jonas party arrived 3 July 1901 from Washington. 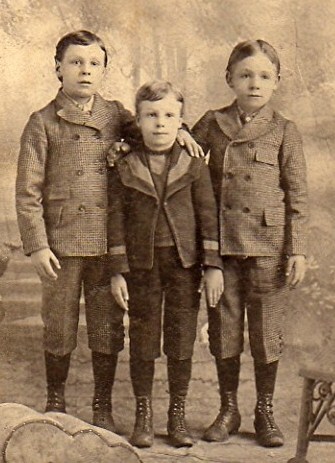 John, Joseph, and William Jonas probably right before moving to Utah in 1901. The photo is stamped with Ellensburg on the matting. Joseph Sr for one reason or another went back to Washington with the youngest child Margaret. Nels suggested it was legal issues, it might have just been the farm that needed attention. Annie’s issues were such that August and his wife, Fidelia, signed an affidavit of insanity and had her admitted to the Utah State Hospital 1 November 1901. 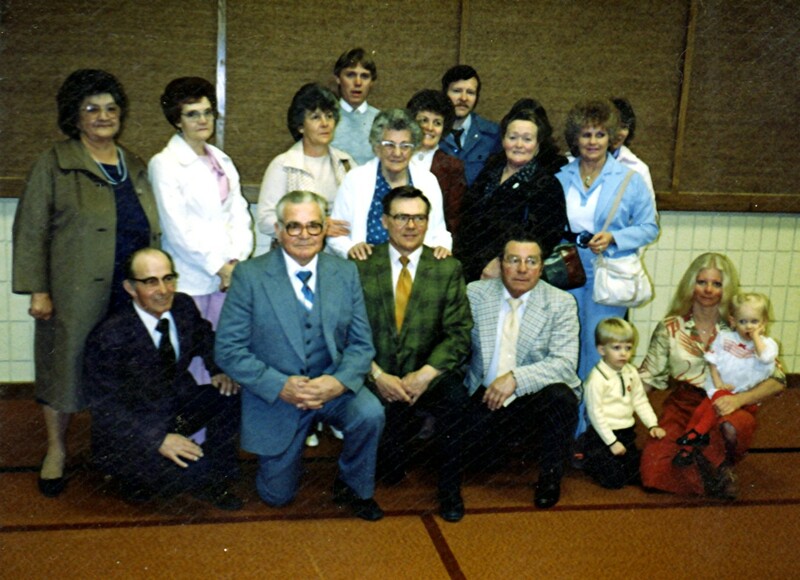 Joseph Sr had been raised as a Catholic and Annie Nelson had been raised LDS. Annie decided she did not like LDS men and wanted to marry a Gentile and did so. The children were raised Catholic in Washington. 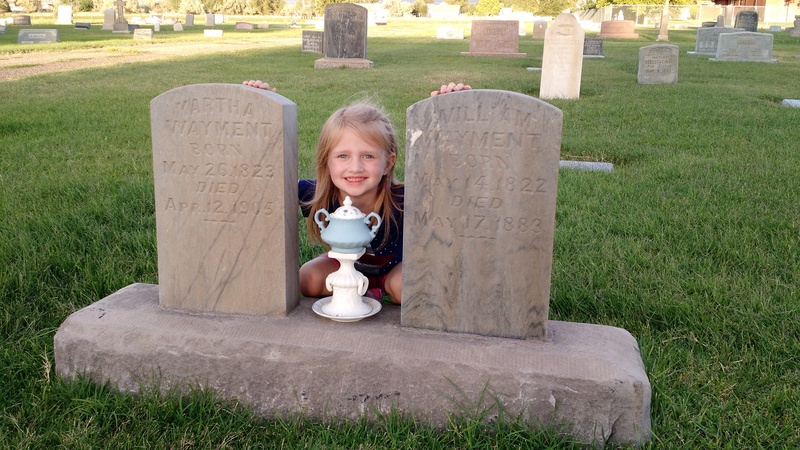 Now in Utah, Uncle August made sure the children learned about the LDS faith. The three boys elected to be baptized LDS on 10 January 1902 in Crescent by their Uncle August in an ice covered Jordan River. All three were confirmed 12 January 1902 by Jaime P Jensen. Rosa joined 6 February 1902, also in Crescent under the hand of Uncle August in a hole chipped in the Jordan River. Margaret did not join as she stayed near her father in Washington. In 1904, Rosa married a boy, Christian Andersen, from Richmond. They married in Salt Lake City, Salt Lake, Utah. They moved to 137 E 100 S in Richmond. Joseph and his brothers resided with Uncle August until after their mother passed in 1907, then they would regularly and for prolonged periods stay with Rosa in Richmond. The 1910 Census lists Joseph at home in Crescent. Read more of Brother John Jonas. 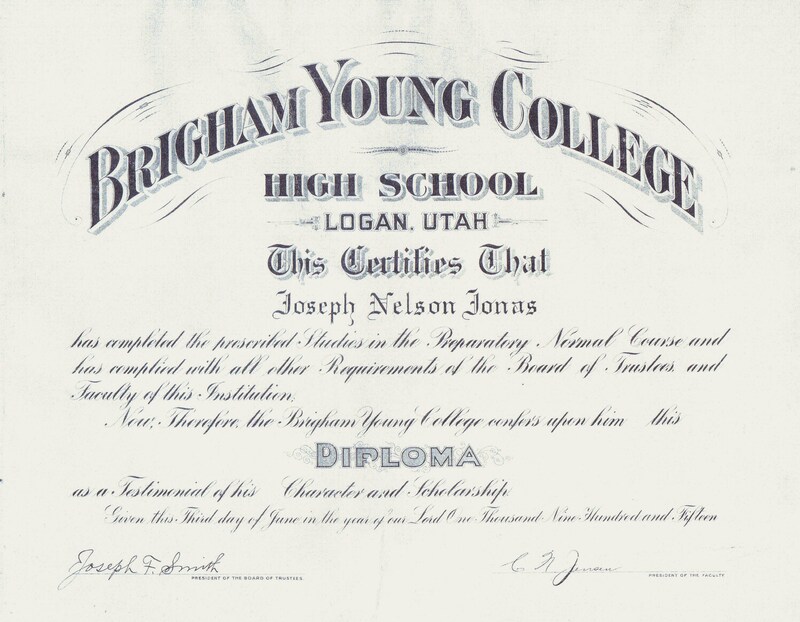 Joseph attended Brigham Young College in Logan and graduated with his diploma 3 June 1915. We don’t know much about his time at Brigham Young College but the story goes he wrestled with their team and did so very effectively. William, Joseph’s brother, was apparently here at school during some overlapping periods. Joseph became well known for his love of gospel conversations. He was known for regularly discussing and even arguing the gospel with extra determination. No hard feelings developed due to his ardor in arguing since others would always agree to a handshake after a good debate. Below is a copy of a picture believed to be from his graduation at BYC. 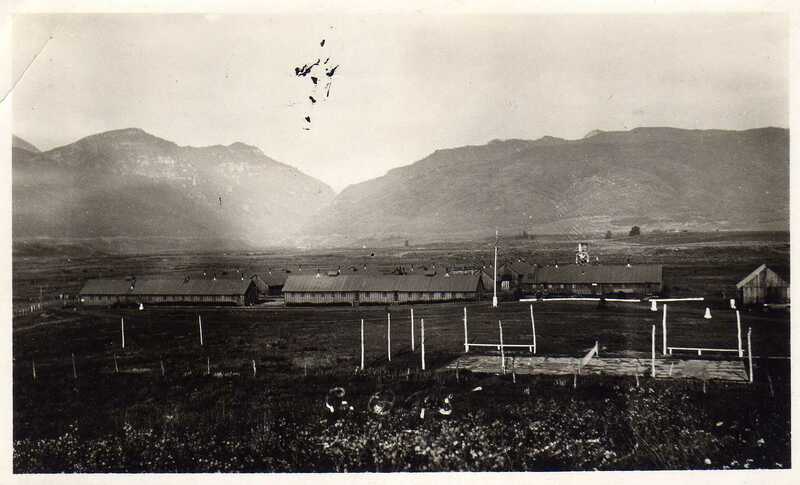 I have not been able to find the original of this photo or a copy at Utah State University’s archives where the Brigham Young College limited records are located (which are less than cooperative on letting me rummage through all the unknown photos). 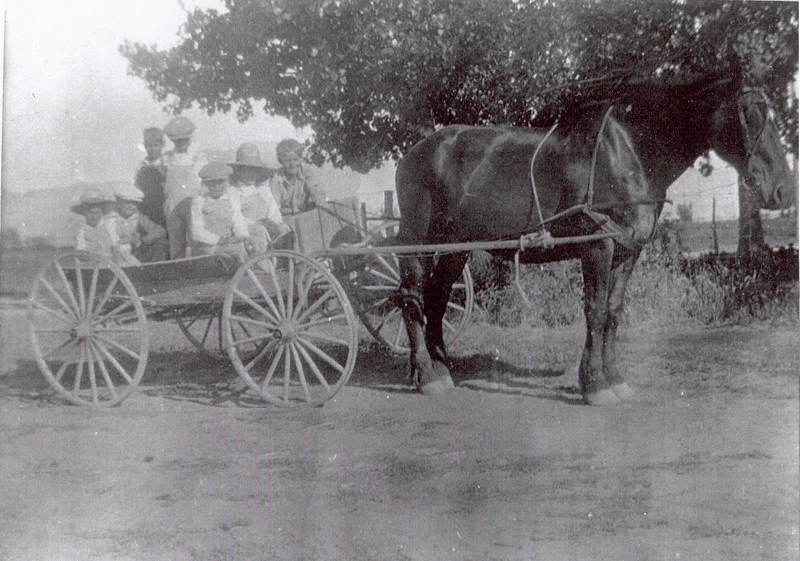 In Richmond Joseph and Lillian met when Lillian’s father, Herbert, hired Joseph to help harvest hay. It was within six months, according to the story, that they were married. The two were married 6 September 1916 in the Logan LDS Temple. Joseph registered for the draft of World War I on 5 June 1917. When he registered, he indicated he was a laborer working for Olaf Neilson, the man who would later become a brother-in-law. He indicated he was taking care of his wife and father. He also indicated that his eyes were brown and his hair was brown. He is listed as short and stout. Here is his signature from that registration. According to his family, he stood about 5’6″ and was very muscular. 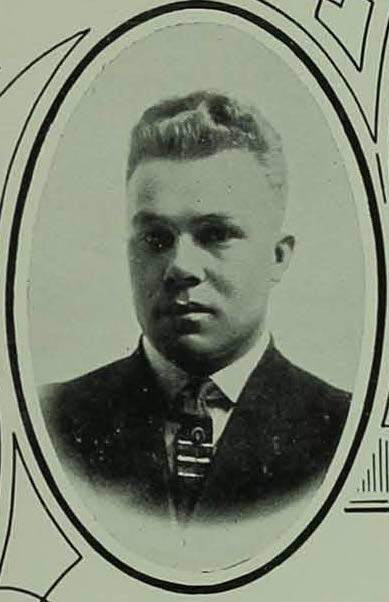 Joseph’s father passed in Richmond in June 1917. 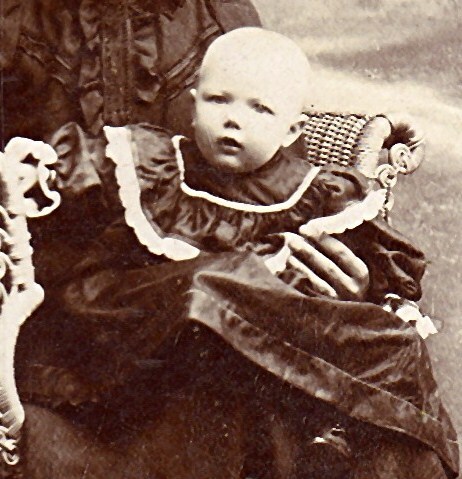 Lillian gave birth to Joseph Herbert Jonas 14 August 1917 in Richmond. 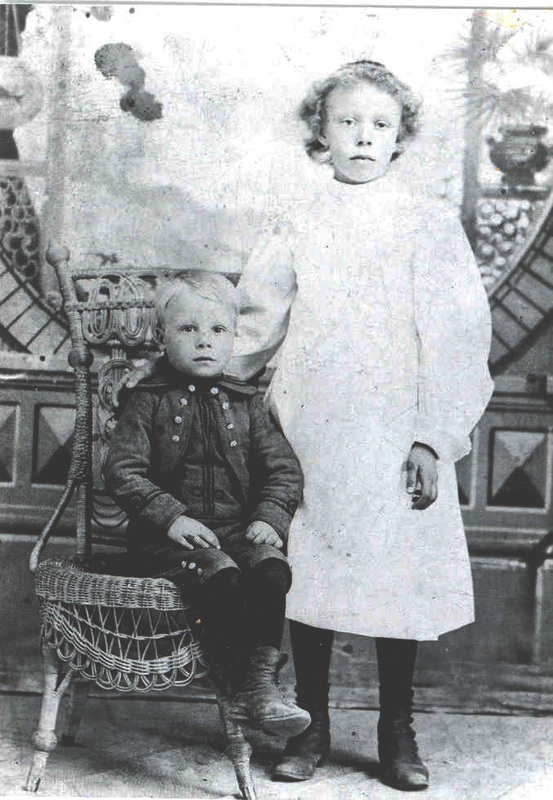 In 1919, Joseph and his two siblings, Rosa and William, had all moved to Idaho. They operated a dry farm raising grain in Cleveland, Franklin, Idaho. 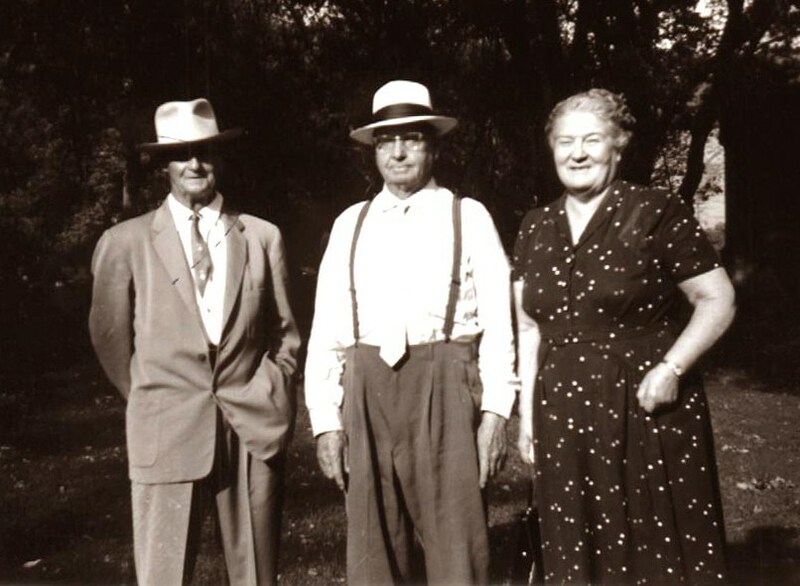 Christian and Rosa, along with Joseph, did most of the work on the farm and lived about a mile apart. William taught at the school in Thatcher, Franklin, Idaho. The Andersen and Jonas families also kept cows, pigs, chickens, and a sizable garden. This is the only home Joseph and Lillian Jonas would together own. 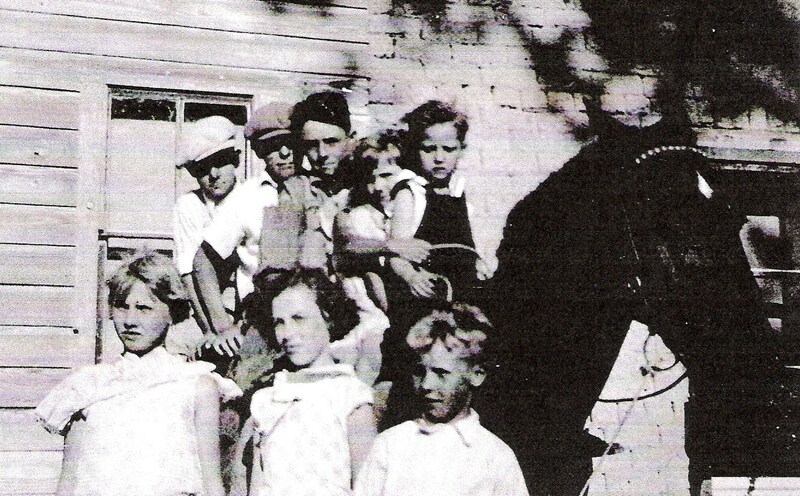 Joseph arrived with the cows in Thatcher on 1 April 1919. Lillian stayed in Richmond due to her pregnancy and while Joseph established the farm. Communications were slow because mail was held at Thatcher. Joseph and Lillian only heard from each other when Joseph made it in to Thatcher to pick up the mail or send a letter. 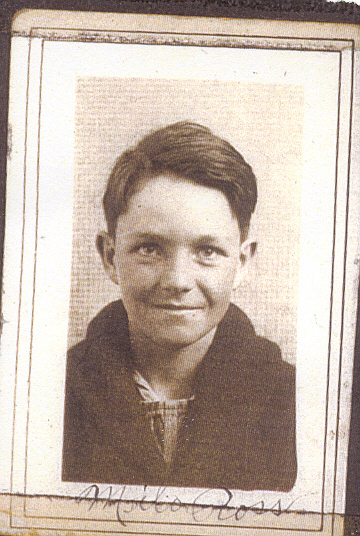 Spencer Gilbert Jonas was born 1 September 1919 in Richmond. Lillian and the two boys joined Joseph in Cleveland. The 1920 Census found the Jonas family on 26 January 1920 living on the Cleveland Road outside of Thatcher. Irwin John Jonas was born 2 September 1921 in Cleveland, but listed as Thatcher. 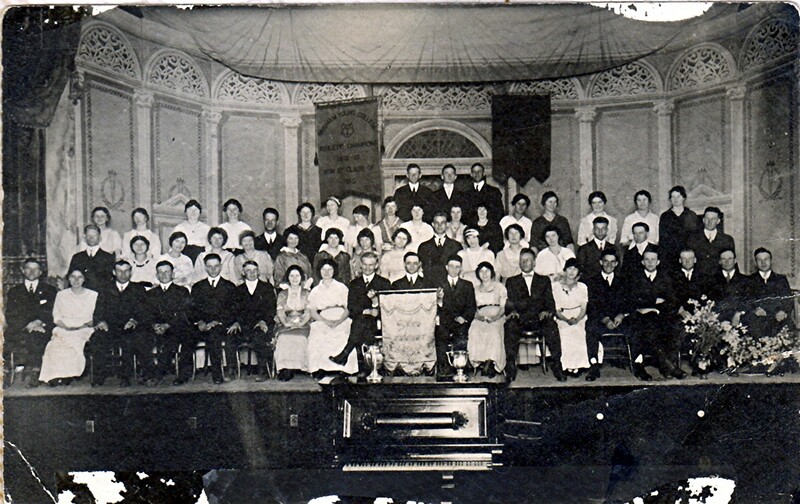 In 1923 or early 1924, the family then moved to Lewiston, Cache, Utah. 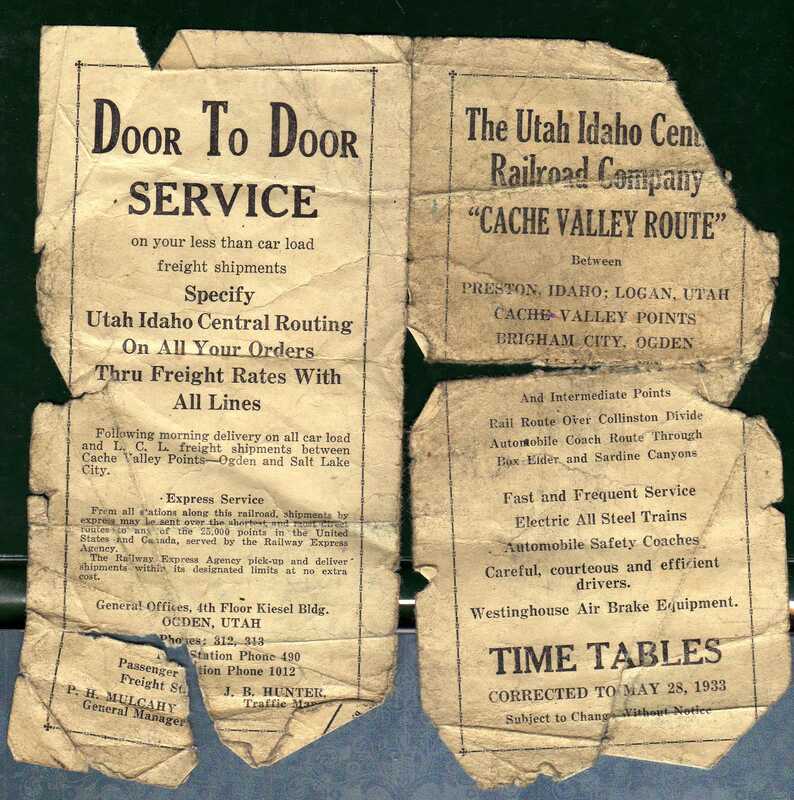 The farm was not working out and he was able to obtain employment with the Utah-Idaho Central Railroad. Joseph worked on a section gang, just like his father had. 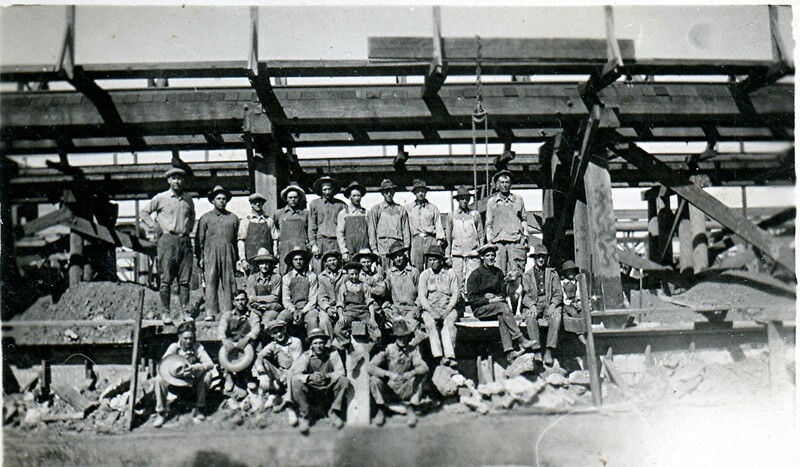 The gang’s job was to repair rotten timbers, hammering in spikes, tightening bolts, and maintaining the rail line. He worked 7 days a week, sometimes all night, coming home only after a shift was over. The family lived in a boxcar that had its wheels removed. A ditch ran under a portion of their home. Another boxcar nearby was used as a storage shed. It was here 15 May 1924 that Wilburn Norwood Jonas was born. Ellis Seth Jonas arrived in this home 6 September 1926, their 10 year wedding anniversary. Joseph kept a tub of furnace oil in the shed. It accidentally caught on fire and and Joseph immediately announced to Lillian that the storage shed would burn down and probably their home too. Joseph, known for being a bit of a prankster, was not believed by Lillian despite his insistence. Joseph ran back to the shed and picked up the burning tub of fuel and carried it outside the shed. While he saved the shed and his home, he found himself in Ogden for several weeks with 2nd and 3rd degree burns. A 9 February 1927 newspaper mention in the Ogden Standard Examiner tells of his being brought to the Dee Hospital on Tuesday the 8th for treatment of burns to the face. In 1927, Joseph was promoted foreman and oversaw the Quinney line through Wheeler, Thaine, and ending at Quinney (now Amalga). Later, he accepted another foreman job and moved to the railroad town of Uintah, Weber, Utah where he lived in row housing. Here is a picture taken while living there. Joseph filed for divorce 2 March 1929 claiming Lillian had deserted him. The article in the paper indicates they had not lived together since 20 February 1928. 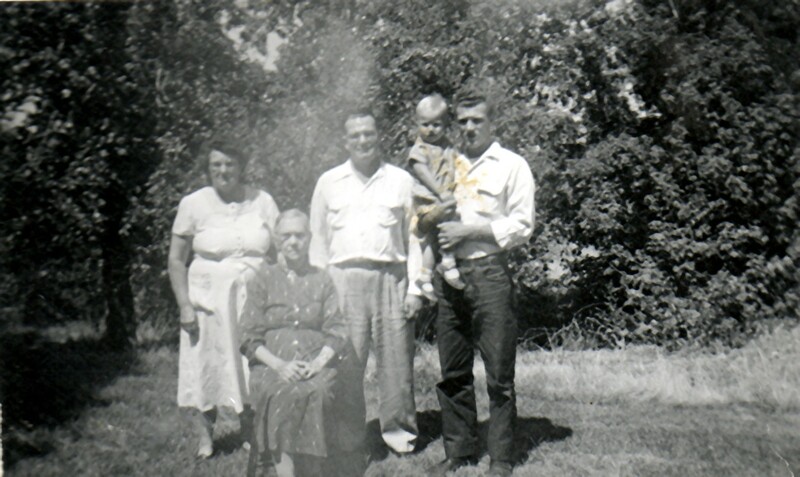 It was during this time on 4 September 1928 that Evan Reed Jonas was born in Ogden. The divorce was dismissed on 9 March 1929 due to the party’s stipulation. Joseph again sued on 8 April 1929. He was ordered to pay $75 a month until the case was resolved. Joseph and Lillian had the case dismissed after they worked out their issues. The family later moved into a comfortable home owned by the railroad at 102 17th Street in Ogden, Weber, Utah. It was a row house, but since he was Section Foreman, the only one with a porch. Joseph’s father, Joseph, had also served as Section Foreman. Joseph’s main responsibility dealt with the Huntsville and Plain City/Warren lines. During this time Joseph and Lillian became known as generous hosts where all visitors were always given more than enough to eat. 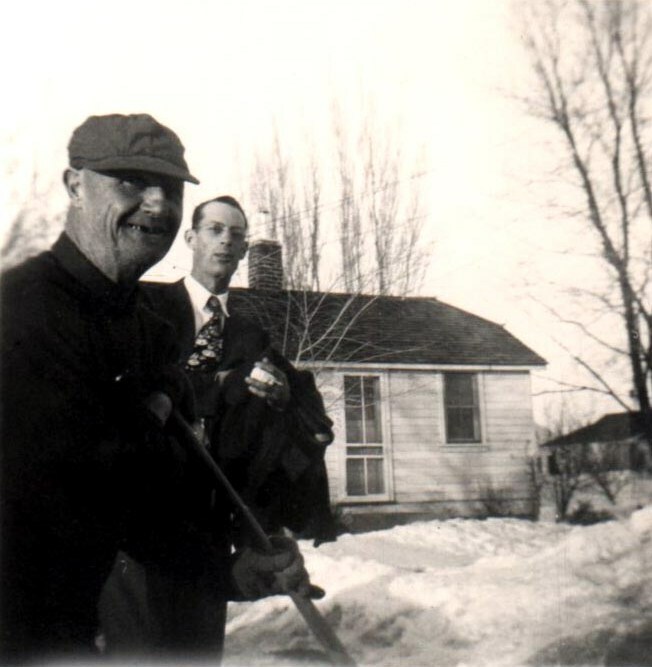 Joseph prided himself on the vegetable garden they grew at this home. On 6 November 1929 Lillian was hit and ran over by an automobile driven by Jack Mobley. It knocked her unconscious but she quickly regained consciousness. She spent the night in the hospital and was pretty seriously bruised and lacerated but suffered no broken bones. Joseph and Lillian admitted they were walking in the middle of the road when the accident occurred. Joseph and Lillian continued active in the LDS church. Joseph regularly debated and discussed religion with others. He was also known to be strict in adherence to principles and expected his children to do the same. He was not afraid to “switch” his children when they got in trouble or disobeyed. One thing family members always commented about Joseph was his ability to remember and recall scripture in a conversation and discussion. Not only that, but when questioned to prove it, he was familiar enough with the book that within moments he could find the chapter and verse. His familiarity with the bible surprised many people, especially from a railroad laborer. 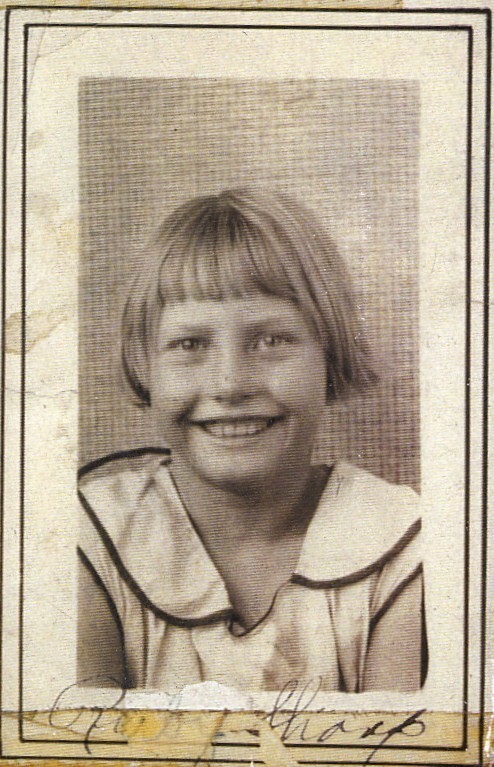 Lillian Annetta Jonas was born 15 July 1930 in Ogden. The 1930 Census found Joseph and Lillian at their home on 9 April 1930. The family was fairly comfortable, they could even afford some of the best appliances. Joseph was especially glad to have a girl after six sons in a row. 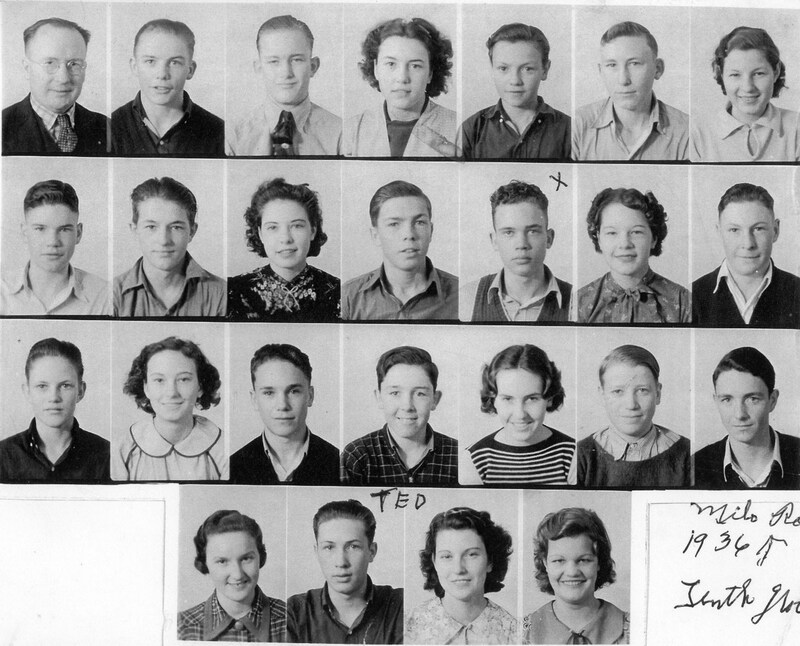 Joseph stands on the back row, second from the left. This is his Section Gang in Ogden. Joseph and Lillian had a scare in 1931 when their son, Joseph, disappeared for a couple of weeks. He had been kidnapped by a Mr. J J Nelson and taken to Pocatello, Bannock, Idaho. He was finally recovered on 20 June 1931. The man was arrested after he beat young Joseph in public and the police determined Joseph was the missing boy from Ogden. 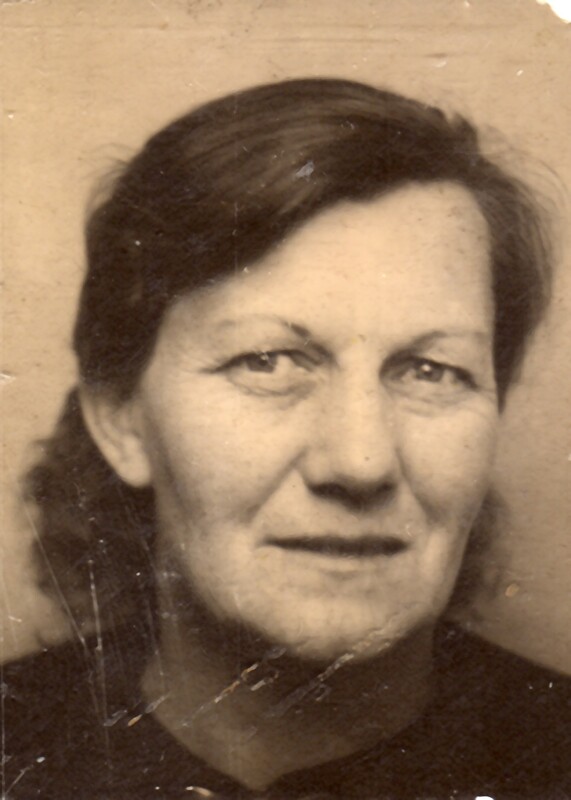 LeReta Mary Jonas was born 1 August 1932 in Ogden. On Tuesday, 6 September 1932, a month after LeReta was born and on his 16th wedding anniversary, Joseph went to work as usual. Joseph knew the dangers of working on the railroad. It was near lunch time and his son, Norwood, was taking Joseph his lunch. Joseph saw Norwood and got down off a trolley near Lincoln and 20th Street, near the American Can Company plant. After getting off the trolley, he turned and walked toward Norwood and hit his head on a wire Mr. Child had strung down to do some welding. (Mr. Child was haunted by this episode the rest of his life because Joseph had warned him about the way he had hung the wire.) The shock knocked Joseph on his back unconscious and not breathing. Joseph died immediately but doctors worked on Joseph for over an hour. Lillian said Norwood was forever affected by the event. Joseph died at roughly 1:00 PM. Here is a copy of the newspaper notice. Here is the burial notice. As a historical side note, here is the front of the train schedule Joseph had in his wallet at the time of his death. 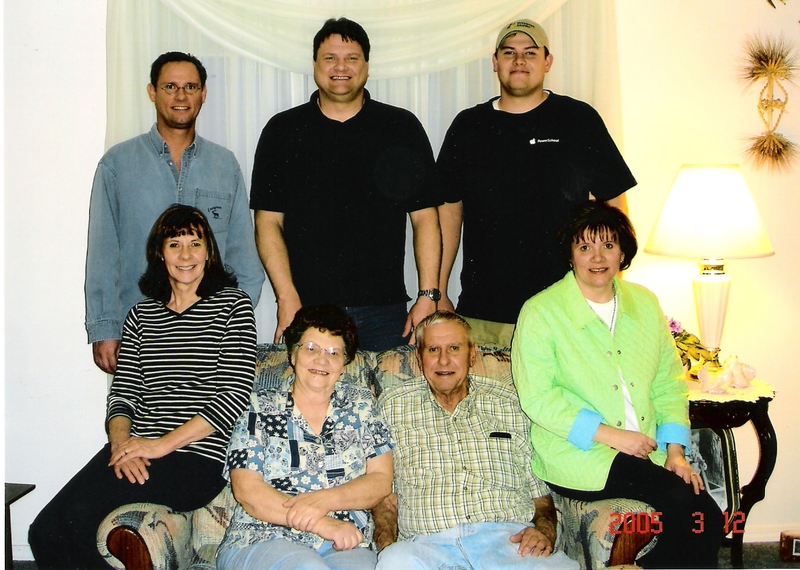 The loss of Joseph dealt the family a hard blow not only with losing a family member, but it also lost them the company housing in which they were living. Lillian, at the mercy of family, moved immediately back to Richmond to be near her family. 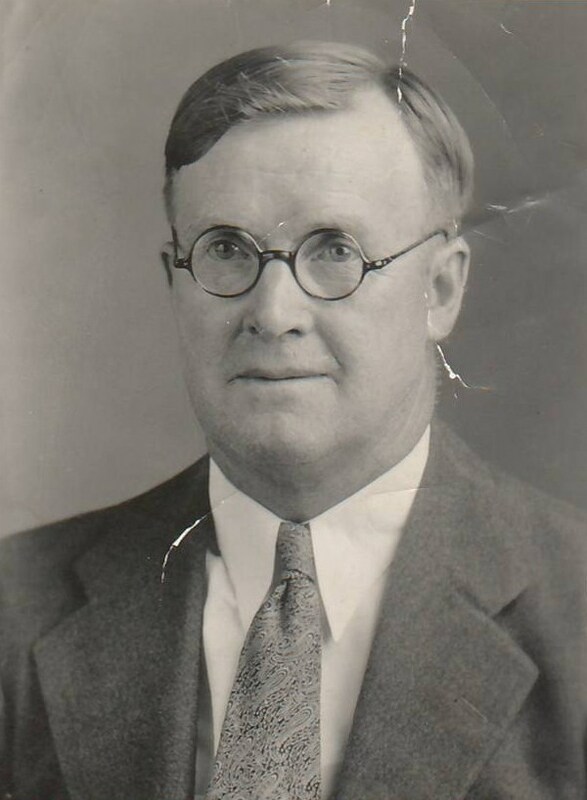 Lillian’s father, Herbert Coley, was appointed administrator for Joseph’s estate. The railroad paid out roughly $1,200 to Joseph’s estate. The funeral, transport, and burial of the family cost Lillian $150. 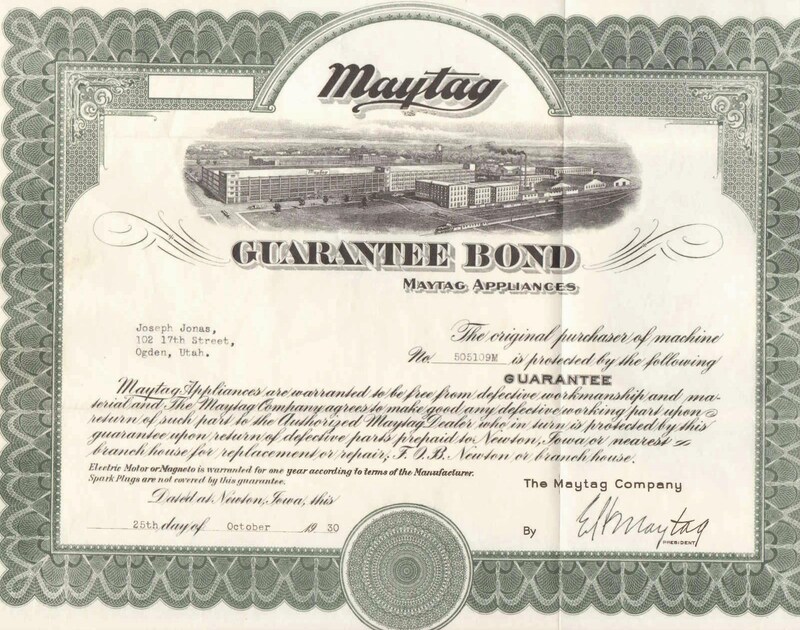 The estate did not begin making regular payments to Lillian until 1934. Until then, Lillian wrote to the railroad for assistance and help. The railroad was happy to provide passes for the family to travel. Unfortunately, the company quit handling company coal so they could not fulfill her requests but allowed the boys to have all the used railroad ties they wanted for firewood. 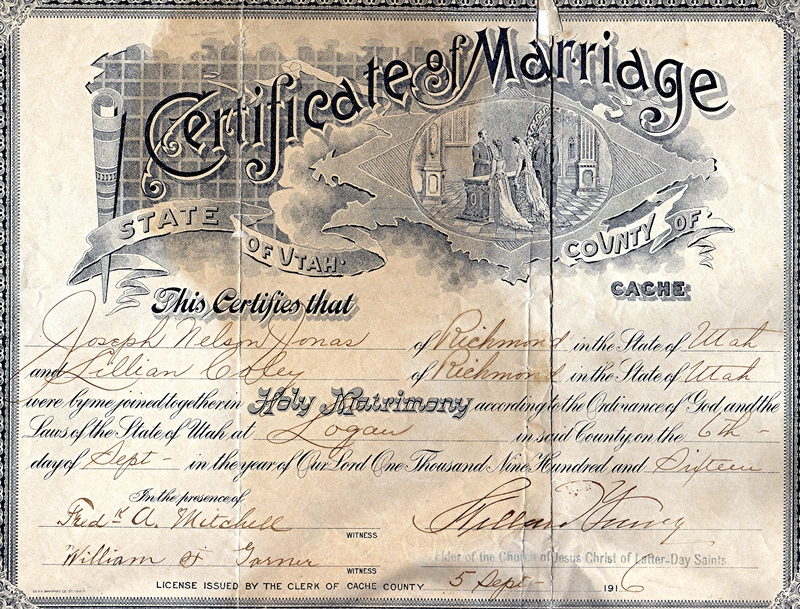 Lillian’s signature from the back of one of the estate checks written to her. Fortunately, the money from the estate was enough to purchase a home for Lillian in Richmond from a Melvin & Bernetta Smith for $500. This gave Lillian a home to raise her children and less worry about providing for her family. The home was located on the north side of the road at roughly 65 E 400 S in Richmond, Utah. 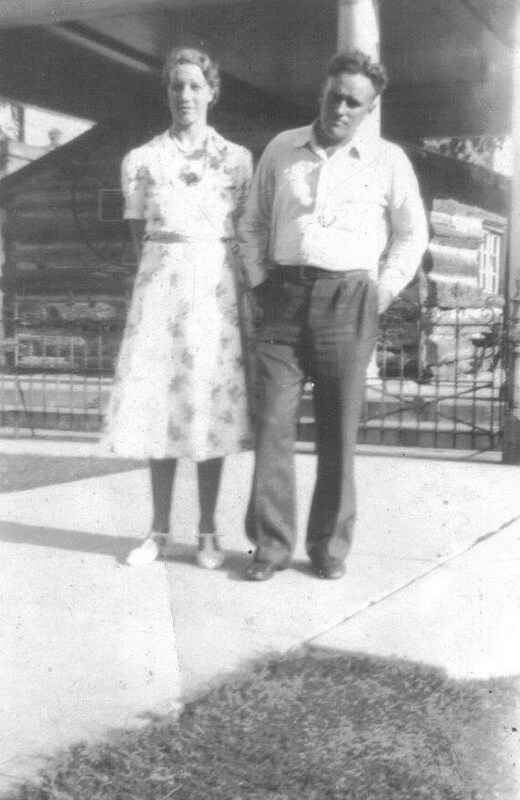 Herbert and Martha, Lillian’s parents, lived across the street, but their home was a good couple hundred feet from the road. Lillian made good effort to raise six unruly, now fatherless, boys and two girls. At Joseph’s death, the children were ages 15, 13, 11, 8, 6, 4, 2, and 1 month. The Jonas brood were known for being a bit coarse and boisterous as the years went on. Only a few years would pass before the children would start marrying. 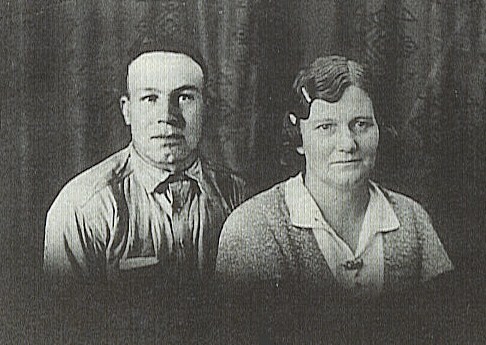 Joseph married Hilma Grace Erickson 17 June 1936 in Logan. Spencer married Viola “Jimmie” Amelia Cole 5 August 1938 in Farmington, Davis, Utah. Irwin joined the army 6 July 1939 and immediately left for training. He eventually married Mary Elizabeth Popwitz 17 June 1943 in Rochester, Olmsted, Minnesota. Evan married Lona Rae Jensen 15 March 1946 in Elko, Elko, Nevada. Norwood married Colleen Mary Andra 27 September 1946 in Elko. 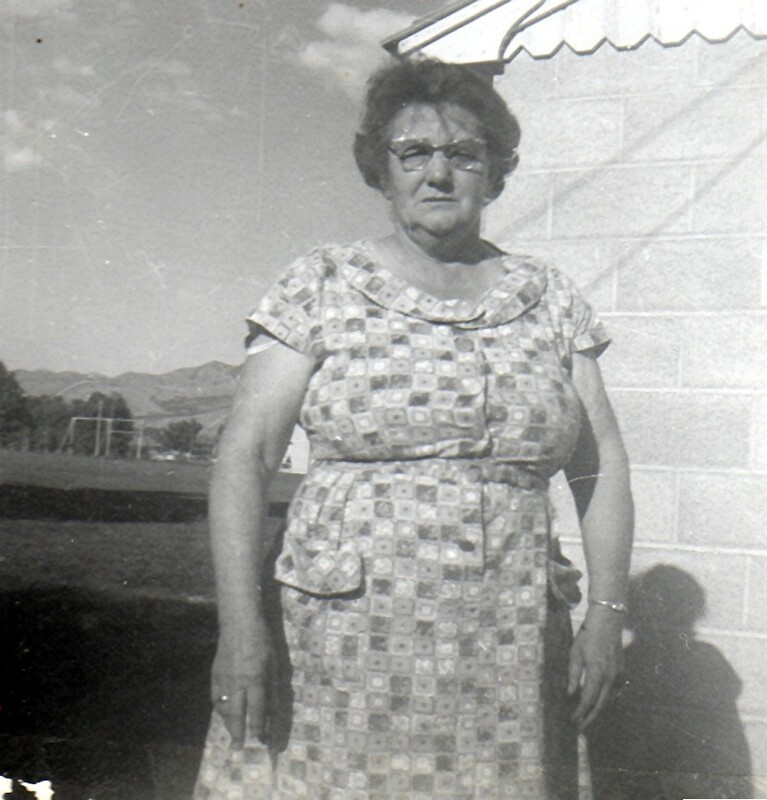 Ellis married Geraldine Pitcher 17 August 1947 in Elko. LeReta married Lowell Hansen Andersen 19 March 1948 in Logan. 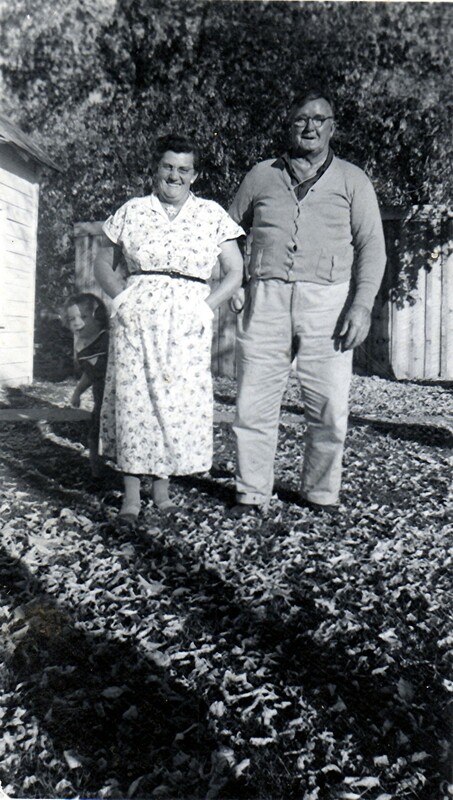 Lillian married Ray Laurence Talbot 16 August 1948 in Ogden. Lillian spent the new few years in an empty home. She knew Lorenzo “Ren” Bowcutt over the years. 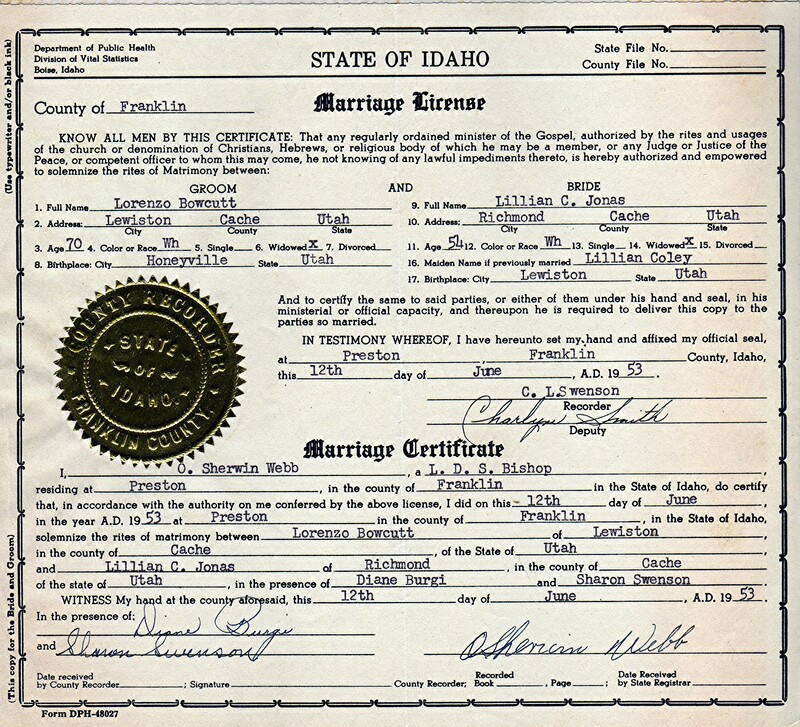 She accepted his offer of marriage and they were married 12 June 1953 in Preston, Franklin, Idaho. At the time of her marriage to Ren, she had 22 grandchildren, 21 living. Ren passed away 5 April 1966 in Logan (born 12 May 1883 in Honeyville, Box Elder, Utah). 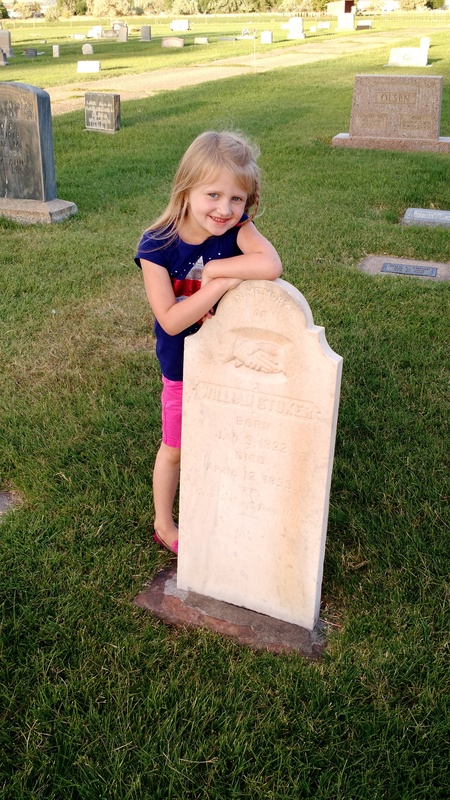 Ren was buried in Riverside, Box Elder, Utah. She lived in the same home until the early 1980’s when she moved in with her daughter Lillian in Layton. 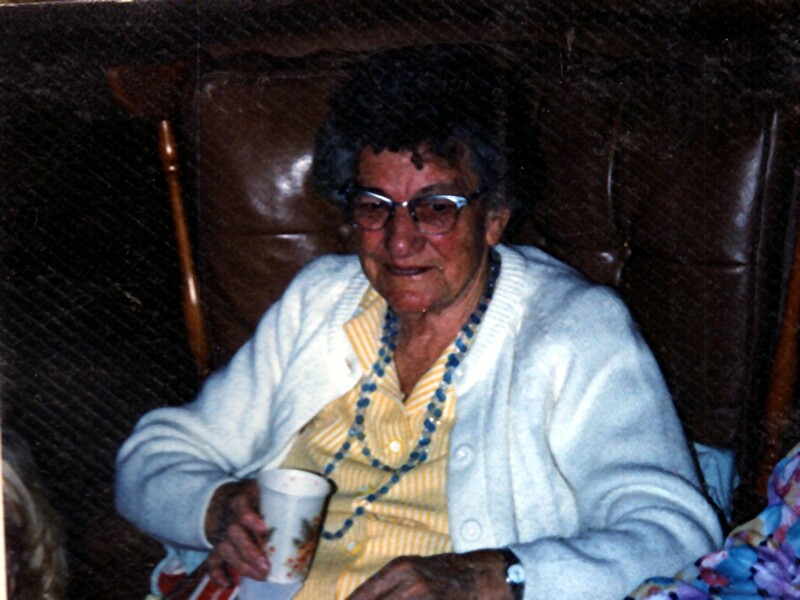 Lillian died 11 February 1987 in Davis Medical Center, Layton, Utah. She was almost 88.5 years old. She was buried beside her husband (55 years later) in Richmond 16 February 1987.